The entire length of time that the UN has existed has been one very long period of when this planet has refused to face reality. The direct actions of Russia three days ago, is the first time in over 70 years that anyone has even attempted to actually do anything about global-crime. When we look back at the number of global-crimes, illegal wars, and crimes against humanity: It's astounding just how much we have tolerated from the so-called 'powers that be' in a world that claims to function according to national and international laws. In this world that punishes the lowliest among us with literally millions of laws in every area of our lives: While neither the so-called states nor any of the global powers, via the private corporations, their banks, their governmental mercenaries or any of their functionaries have ever had to face-reality for anything they've done to anyone else—throughout the entire era of the so-called United Nations. The global banks,using their economic hit-men and all their so-called powers in charge of forcing every nation into global-slavery since 1945. This has led directly to the end of most of the lesser nations of the world. What the world is now facing in the Middle-East, in Ukraine and in Europe, are the remaining nations that have yet to be brought under total control. None of this is new, but the missing fact is that because no 'power' has ever been forced to face reality—for their actions—the spread of criminal barbarity has grown until the planet is facing extermination by ISIS, Al Queda and a dozen of their off-the-books terrorist organizations that are being funded and promoted by Israel and US Inc. Here's the first instance, in the skies over Syria, of yet another Israeli-war crime in the making, that was revealed today as it was dealt with by Russia. ...“EXCLUSIVE-Strategika 51: Six Russian fighter jets type Multirole Sukhoi SU - 30 SM have intercepted 4 Israeli McDonnell Douglas F-15's fighter bombers attempting to infiltrate the Syrian coast. The Israeli F 15 warplanes have been flying over Syrian airspace for months and in particular the coast of Latakia, which is now the bridgehead of the Russian forces in Syria. The Lebanese army has officially announced at 2313 Z (local time) that four "enemy aircraft" (Israeli) had crossed the airspace of the Lebanon. This 'incident' between the Russian and Israeli combat aircraft struck with amazement the command of the Israeli air force, which has estimated that a possible dogfight between F-15 Israelis and the Russian Su-30 would have led to the destruction of the four aircraft Israelis. Israel has strongly protested to Moscow of the incident but the Russians demanded explanations about the presence of Israeli military aircraft in full Syrian airspace. 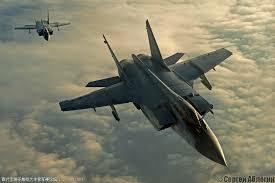 This incident indicates that the protection of Syrian airspace is now under the protection of the Russian air weapon. What causes gnashing of teeth in Washington. The incident has been ignored by major news agencies but relays political and media of Israel in the United States, Europe and in the Arab world will redouble their efforts to demonize the Russian support for the Syrian Government. The behind the scenes stories across the world are always the same. A political 'FACT' is alleged to be true about some nation, its' policies or its leader and instantly the world is told that this person or that nation must undergo 'REGIME CHANGE'. No arrest is made, no trials are ever held, everything that the global-leaders-allege is assumed to be true. No arguments or facts are allowed to interfere with the murder of the person or the nation that has fallen into the trap laid by the West. Even after the fact when it is proven that the charges were all false—still nothing is done and the never-ending war against the nations continues unabated, because there's far too much money to be made to even think about stopping the war (i.e. WMD's in Iraq and dozens of false charges with Qaddafi in Libya and Assad in Syria). How else can this be seen when the West is demanding that “Assad must go”, (based on no evidence and even less facts than were supposedly at issue) with any of the other-leaders that have been ground into dust: Even after Assad stayed with his people and endured over five years while he defended his country with the support of his people, and now the real-support of Russia which Assad asked for, to help: And still the whimps in the USI are demanding that “Assad Must Go, even after he has helped his nation to survive our five year war of attrition against his innocent nation. Go back and count the number of times when 'wars' supposedly broke out. From Korea to Africa, from Vietnam to Yugoslavia, Rwanda, the Middle-East to Ukraine: How many times did any other major-force ever come to the aid of any country that we, the Barbarians, have attacked. How many times was actual evidence presented to the world for the war-crimes' that were all rushed into? 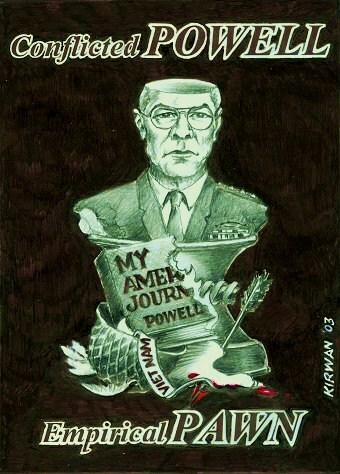 Think about General Colin Powell in front of the UN just lying his head off, and he knew that everything was just a giant concoction that could never be proven, but he 'made the Bushwhacker's case before the world' which in the end turned out to be nothing but lies. Look at the number of communists in the US Government today, which includes Obamanation. Not to mention the colossally inept such as Victoria Nuland, Susan Rice, Samantha Power in the UN along with all the fools in the Department of Defense, and the traitors in the Just-Us department along with the totally criminal Supreme Court. Never-forget the entire US Congress, with perhaps a handful of Americans: while the rest of them that are all paid for traitors to America, that are serving Israel today, right down to the last drop of American blood, spilled for nothing. The entire world could change if and when we finally 'FACE REALITY' across the board. To realize this possibility we must take these Barbarians down, wherever they've raised their criminal-designs to the level of any government policy ­ anywhere.